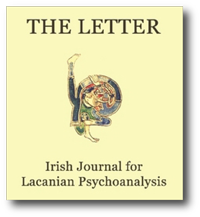 This double issue of The Letter sees the publication of the proceedings of the conference Treatment Challenges in Psychosis: Voices of Difference – Psychiatry and Psychoanalysis in Dialogue held at St Vincent’s University Hospital, Dublin on December 6th 2013. We should consider it remarkable that all ten speakers on the day have contributed written transcripts of their talks for this important issue.1,2 It is equally remarkable that a conference such as this takes place at all, allowing for the entrenched positions that psychiatrists and psychoanalysts can assume when it comes to their contrasting approaches to a topic such as psychosis and its treatment. Since 2008, this, the fourth in a series where we have come together to enter into dialogue on the topic of psychosis, is the second in the Voices of Difference series, where we are taking as our focus the treatment challenges that it poses. The publication of Cormac Gallagher’s translation of Guy Le Gaufey’s acclaimed book Lacan’s Notall: Logical Consistency, Clinical Consequences in four segments, reaches completion in the current issue of The Letter with the appearance of the third chapter, Some Clinical Consequences of the Logical Difference between the Sexes. The sequencing and timing of the appearance of the four segments was again decided by the teaching and research interests of members of ISLP who were drawn to study different areas of the book at different times. Many made do with earlier proofs, particularly of chapter two Towards a Critical Reading of the Formulae of Sexuation which are now well thumbed and dog-eared, such was the excitement in 2006 when we were introduced to Le Gaufey’s reading of the formulae. This middle chapter was ﬁnally published in 2008 in the ﬁrst issue (Issue 39) of a re-deﬁned journal The Letter Irish Journal for Lacanian Psychoanalysis, with chapter one appearing in 2010 (Issue 45) and a scholion in 2011 (issue 47). Regarding chapter two, this served as the primary text for my own teaching over an eight year period in the School of Psychotherapy at St Vincent’s University Hospital where, I observed, that its subject matter captivated many. We now bring you chapter three, which has a wide-ranging content not fully captured in the title Clinical Consequences… In the early sections, Le Gaufey forever ties down where, in the Three Essays, Freud with the use of the remarkable word ‘solders’, essentially allows for an originating absence of rap-port between the sexes. ‘..The sexual instinct and the sexual object are merely soldered together’, Freud says, thereby refuting a whole tradition where ‘every deviation with respect to a ‘properly’ soldered Trieb and Objekt – genital maturity, so called – ‘allowed the new concept of “perversion” to be thought out with the musty smell of unhealthy pathology’. According to Le Gaufey, Lacan continued the ﬁght against this pathologising trend with his now famous dictum ‘there is no sexual rapport’, a dictum that was painstakingly arrived at by means of an unrelenting interrogation of the square of opposition – a centuries-old touchstone of classical logic based on the sovereignty of the universal. For all our sakes, the formulae of sexuation is the outcome of this interrogation to which, in this chapter three, he hauls us back to again confront the quality of absence at the heart of the particular negative – Lacan’s neologistic notall – and how it shares ‘no space’ with the universal, now diminished and knowable only by means of a symbolic value. A highlight of the chapter is Le Gaufey’s critique – tempered by the conclusions of Lacan’s formulae – of the clinical vignette. ‘Born in the crucible’ of the minimal particular – where it is but an instance of a universal, conforming to a preconceived construct, a categorization already in place – the clinical vignette is correctly ‘diagnosed’ as serving ‘a collectivity engaged in acquiring professional mastery’ where, by its ‘imperious logic’ it ‘predisposes it to miss out on some of Lacan’s fundamental intuitions regarding the sexes and the standing of analytic knowledge in the clinic of that name’ It demands a consensus within a group (an ‘irenism’ which postures as peace-loving) which becomes ‘reversed into a warlike passion when it is a matter of considering a paradigm foreign to it’. By contrast, a clinic based on the maximal particular – some but notall – is, for any of us more difﬁcult to articulate. Le Gaufey attempts this on the very last page of his chapter three as follows. Quoting Lacan’s deﬁnition of the analyst’s desire to obtain ‘absolute difference’, he states ‘we try to allow thought (editor’s italics), which is only able to produce relations (again, editor’s italics) to hand over to the tongue so that it may be able to outline ..an edge..not a frontier, constituted by a lack of neighbourhood which alters its relational capacity, its aptitude for entering into relationship’. Le Gaufey’s text is challenging and requires an engagement with the thought of the logicians – Peirce, Benjamin, Quine, Blanché to name a few – but how else can we make our own of texts such as this, unless we familiarise ourselves with the proper ﬁelds of knowledge that inform them? The title of Jacques Laberge’s paper CMJOYCIRENSFW – a portmanteau word – fuses the beginning, Chamber Music (CM) and the end, Finnegans Wake (FW) of Joyce, the singing writer or the writersinger’s immense literary song. This paper was ﬁrst presented at the Joyce-Lacan Symposium in Dublin Castle before an international audience of psychoanalysts in 2005. Laberge’s thesis is that, through serial identiﬁcations with Ibsen, Wagner and ﬁnally, the tenor John Sullivan – who told Joyce he was banned from singing in some important opera houses – Joyce could become the artist, God-like yet banned himself, in likeness with Sullivan. These identiﬁcations being secondary to ‘a lack of identiﬁcation through meaning’, served as a ‘repairing sinthome’. This is a fascinating paper that touches on many facets of Joyce’s work. Taking Ulysses, each chapter, as we know, representing an organ of the body, Laberge judges the grand over-arching sublimatory schema of the book as descriptive of bodily fragmentation. Within each chapter, an organ comes to be annihilated, which ‘cannot (then) be joined to the next organ that will be high-lighted in the next chapter’. Joyce valued the voice of the singer above any instrument. Faithful to the theme of music, the Sirens episode it particularly privileged by Laberge as its organ is the ear. In this chapter 11, the orchestra of sounds brought into being by the Sirens of the Ormond Hotel, Bronzelydia and Minagold, through the clashing of Homer’s metals of bronze and gold, is riveting. Joyce’s insistence, throughout his work, on the transposition from ‘sight to sound’ as the ‘true essence of art’ was informed in part by his insight that ‘you hear more in dreams than you think, more than you remember’. Laberge’s conclusion – that Joyce ‘the singer invades the writing’ thereby ‘radicalising the expulsion of meaning’ – gives much food for thought and justiﬁes the in-exhaustible preoccupation with this genius of the word and of sound as word. Finally, with all the largely negative things written about his father, John Stanislaus, the fact that it was by means of singing that James kept faith with the ‘musical voice’ of his father strikes a very poignant note. Tom Dalzell’s paper Delusional Ideas of God and The Devil was ﬁrst presented at All Hallow’s College in June 2011 to an audience of mainly religious. Dalzell is highly regarded within our group as the author of Freud’s Schreber between Psychiatry and Psychoanalysis: On Subjective Disposition to Psychosis and he returns to Schreber to delineate how, for Freud, the duality be-tween God and the devil was reﬂective of Schreber’s father complex. He also examines Freud’s 1923 account of the case of Haitzmann, a seventeenth century painter suffering from a devil neurosis, and asserts that, in both this case and that of Schreber, a feminine attitude towards the father was in evidence. Dalzell’s scholarly account of how differing religious traditions interpret ideas of God and the devil is revelatory, particularly the view within Christian theology that God can be understood as ‘loving and punishing, like Freud’s God and the devil, a God who, for Luther at least, must ﬁrst be the God of love’. This paper remains faithful to the oedipal ‘letters patent’ of psychoanalysis where Freud’s oedipal father and Lacan’s non/nom du père would have had a resonance with a religious audience where belief in God as Father is a constant. Nonetheless, Dalzell rightly emphasises that analysts and ministers of religion listen differently to patients who are suffering from delusions. He cautions us to put ourselves in the position of a little other i(o), a position that is reminiscent of Lacan’s ‘we are brothers and sisters to our patients’ and that has to be further informed analytically. Gustavo Cetlin works in Centro Mineiros de Toxicomania, the ﬁrst public in-stitution in Brazil to offer psychoanalytic treatment to patients with alcohol and drug addiction and is co-ordinator of the Centre’s research and teaching programme – Nucleo de Ensino e Pesquisa. In his paper, Case by Case: Approaching the Subject of Drug Abuse in Times of Over-Consumption, he elegantly describes how such over-consumption in all its expressions is an ‘exercise of repeating beyond the limits of pleasure’ – pleasure as deﬁned by Freud in Beyond the Pleasure Principle. He delineates how society with its ‘just do it’ philosophy ultimately leaves the subject in the lurch. In Ireland, we are certainly not immune from the world-wide reach of addiction where its ravages are felt in every small town. The insistence of addiction as ‘a modern practice’ updates the debate promoted by Cetlin ‘between the biological and subjectivity or the instinct and the drive’. By attempting to return to a biological organization that matches an instinct to a single object, Cetlin proposes that the addict wants to be part of pure nature, wants to retreat from being a subject marked by language to a state of silence. By somehow making the Other reachable, psychoanalytic treatment is then the attempt to ‘force the impossibility of a natural condition’. The ‘somehow’ that Cetlin outlines is in three moments: Rebuilding the Other, Diagnosis – based, not on psychiatric diagnosis but on the subject’s form of relating to the Other – and Act. Can this be attempted as explicitly delineated by Cetlin? When we consider the standard treatments for bulimia, anorexia nervosa and other addictions within our own mental health settings – where even a psychoanalytic hypothesis such as Cetlin outlines is woefully absent – can we yet say? Olivia Fox’s Can I Say Who I Am is perhaps a model for the subtlety required to address the in-between nature of the subject we encounter in analysis. This paper comes of her participation in one of ISLP’s cartels where she presented it at the Inter-Cartel Study Day in June 2103. In light of the ‘saying’ and the ‘said’ introduced by Lacan in the late sixties and early seventies, and in L’Etourdit in particular, Fox’s stated aim is to re-examine ‘empty’ and ‘full speech’, ﬁrst introduced by Lacan in 1953 in The Function and Field of Speech and Language.. By means of thoughtful and measured quotation and enquiry, she breathes a freshness into these terms and goes on to remind us of the theoretical distinctions wrought by Lacan at this time between speech and language. There are undoubted similarities between the opposed terms full and empty speech and the saying and the said, but they are not equivalent, nor does the author make any such claim. A whole questioning of a logical tradition that excludes the subject has been undertaken by Lacan in the intervening years, making for more work to be done in order to evaluate the differences. Let us begin by looking at an example in the Irish context of how psychoanalysis and psychiatry can work together. James O’Connor gives us a personal account of how he has come to establish a locus for psychoanalytic work with the Dublin North Mental Health Services. And his colleague in the same service, psychiatrist Malcolm Garland, in his ‘Brief reflections from the front line..’ adds his support for O’Connor’s endeavour, while giving emphasis to the limitations of the medical model in psychosis treatment. This might serve as a beacon of hope for those of us who are confronted by a low tolerance for psychoanalytic practice within the public psychiatric service. However, ‘the Irish situation’ falls short of what has been realised in other jurisdictions. How the issue is addressed elsewhere is eloquently brought to our attention by Tom Dalzell and Bent Rosenbaum in their respective papers. The actuality of The 388 in Québec City, described by Dalzell as a clinic for the treatment of psychosis ‘after Lacan’, allows psychoanalysis to function, while support- ed by bio-social interventions, in a quite revelatory way. Equally significant is Bent Rosenbaum’s account of the Danish National Schizophrenia Project where he was a lead investigator. This project involved fourteen psychiatric units across Denmark, where the merits and demerits of manualised supportive psychodynamic psychotherapy for patients with first-episode psychosis were compared with ‘treatment as usual’. Such tangible progress aside, let us not shy away from what remains at the heart of what both unites and separates psychiatrists and psychoanalysts. This is the clinical encounter with the ‘thinking’ of the psychotic, ‘(a) structure into which psychiatrist and patient, psychoanalyst and analyser are plunged’, according to Christian Fierens. This is where lack itself, he continues, ‘opens a new kind of thinking’. This ‘new kind of thinking’ is what the theory of Lacan proposes. Mindful of the sub-theme for the conference – the challenge of therapeutic engagement with someone suffering from negative symptoms – this ‘new kind of thinking’ has to be taken very seriously. In his paper, Fierens emphasises how an approach that does not view negative symptoms as a symbolic deficit, as ‘a lack which can or can’t be be filled in’ is what allows the question of the subject to be posed, a question prior to any possible treatment of psychosis cf the title of Lacan’s 1956 paper. In my own contribution, I have attempted to ‘colour in’ or give clinical substance to the possibility of such an approach that takes as its starting point ab-sens, differance, the necessity of a ‘clinic of failiure’ etc – all highly specialised terms in Lacanian theory as out- lined by Fierens in his latest book The Psychoanalytic Discourse. A Second Reading of Lacan’s Etourdit. Why ‘a clinic of failure’? The psychoanalyst speaks about a clinic that dis- appears at the moment it is spoken about – allowing no reproducible, consistent findings, and no measurable evidence base to emerge. But, as Barry O’Donnell decribes it, the mental is unstable and destabilising, requiring that the practitioner should have support to handle this without demanding it to be stable, to handle it in its instability. In their paper, Sheila Clarke, Elizabeth Lawlor and Mary Clarke who have responsibility for DETECT, the early intervention for psychosis programme in South County Dublin and Wicklow, rightly emphasise that the patient has to be willing to engage with treatment and individual interventions in a sustained manner, psychoanalytic or otherwise. This, however, surely prompts a further consideration, as to the possibility of mainstream psychiatric interventions being leavened by or intercalated with a different kind of independent listening which is strictly psychoanalytic. Might not the patient then be more willing to engage with such a service in a more long-term fashion? Or is this a dangerously utopian aspiration? As Barry O’Donnell puts it, etymologically, a ‘condition’ is ‘a saying with’, con + dicere. Can such a distinction come to matter? Perhaps it can. When we listen to Joanna Moncrieff on the limits and hidden human costs of pharmacologic intervention in psychosis, she leaves no room for complacency for anyone, least of all patients and their families. Her ac- count of how, in the space of sixty or so years, anti-psychotics came to be promoted as correctives of an underlying abnormality in the brain, purported to be somehow ‘causative’ of schizophrenia is sobering – the so-called disease-centred model of action. The evidence she cites for the effect of antipsychotics on brain tissue mass should equally trouble us. We will conclude with two recommendations put forward by Cormac Gallagher. Firstly, in listening to our patients we must try to actively rid ourselves of MSP – malignant social psychology. This is a term coined by Tom Kitwood to describe how we treat patients suffering from dementia differently, once they have been labelled with such a diagnosis. Is this any different for some- one suffering from psychosis? Secondly, he advises us to develop a ‘poetic awareness’ in relation to what the patient is saying or not saying. With such encouragements, blessed indeed are the peace-makers, …the pace- makers, …the pace-setters. Let us aspire to be among their ranks and continue to talk to each other. 1 The papers from the conference are presented in the sequence in which they were delivered on the day. 3 Recalling Niels Bohr’s ‘No paradox, no progress’. Dementia has been described as the major mental health epidemic of the 21st century. Yet far from being the living death it was seen as up to the 1980s, revolutionary new research, lead by Tom Kitwood, has shown that, while people suffering from the illness have undergone severe cognitive impairment, they retain a deeply subjective, visceral intelligence that allows carers to communicate with them to a degree formerly thought impossible. Psychiatrists and psychoanalysts who work with psychotic patients have much to learn from this re-discovery of the subjectivity of dementing patients and the need to counteract the ‘malignant social psychology’ that affects both groups. In return they have much to contribute to an enrichment of ‘reminiscence therapy’ now seen as a key technique in the treatment of dementia. Keywords: Dementia; psychosis; Kitwood; reminiscence therapy; malignant social psychology; Lacanian psychoanalysis. This paper was intended to be a discussion on psychosis in Lacan’s L’tourdit as reread by Christian Fierens. But it was blown off course by a chance en-counter with what, for me at least, were new ideas and research which brought back a memory that took me in an unexpected but I hope fruitful direction. THE LETTER 55 & 56 Spring/Summer 2014, pages 13-25. This talk challenges the current assumption that psychiatric drugs work by correcting an underlying ‘chemical imbalance,’ or any other brain-based abnormality. An alternative, ‘drug-centred’ model of drug action will be out-lined that proposes that psychiatric drugs induce altered mental and physical states, and that these states may sometimes be ‘therapeutic’ by helping to sup-press the manifestations of mental distress and disturbance. A drug-centred account of antipsychotic action will be presented that stresses the cognitive and emotional suppression produced by the drugs and how the desired and adverse effects of the drugs cannot be neatly distinguished. The impact of these effects on the symptoms of severe mental disorders will be discussed along with the practical and ethical implications of this sort of approach. I would like to begin by thanking Patricia McCarthy for inviting me to speak at this conference. Part of my reason for attending is to hopefully learn some-thing about Lacan and the opportunity he provides in saying something new to psychiatrists about psychosis. I also wanted to add my agreement to the comments made by the last speaker, Cormac Gallagher with regard to allow-ing the patient tell his or her story. It is time not only to restore the patient’s story but to also put the history back into psychiatry. THE LETTER 55 & 56 Spring/Summer 2014, pages 27-39. Psychoanalysis is a practice launched by a neurologist, Sigmund Freud, based on the interpretation of dreams, products of every mental life which signify so madly that the normal and the pathological become indistinguishable. With the work of the psychoanalyst and psychiatrist, Jacques Lacan, psychoanalysis recognizes the human subject as a subject of the effects of the functioning of language. This requires that the practitioner in the field of the mental attend to the speech and language of a patient – one who is suffering a disturbance in their symbolization of their world. This requires a listening which refuses submission to the expectation to quickly fix a diagnosis with seeming certainty, a listening which resists the pressure to form an opinion on the basis of unreliable outward signs. This paper raises a number of points which support this contention, in in order to promote serious consideration of the consequences for practice for the position that psychosis is a disorder of the subject in language. Jacques Lacan, …ou pire: 9th February 1972; passim. THE LETTER 55 & 56 Spring/Summer 2014, pages 41-52. Recent research does not support the pessimistic view of recovery outcomes in those receiving early intervention for psychosis. However the effectiveness of any intervention depends on the willingness of the patient to engage with intervention in a sustained manner. Engaging people with a psychotic illness can prove challenging. Understanding the role of individual appraisal may contribute to the engagement and management of the illness and lead to improved recovery. Science cannot solve the ultimate mystery of nature and that is because in the last analysis we ourselves are part of the mystery we are trying to solve’ (Max Planck 1858 – 1947). In the mental health field,through multidisciplinary collaboration, we are continually trying to improve the services we provide for our patients. For psychosis, recent research does not support the traditionally pessimistic view of recovery outcomes, and there have been many promising developments, particularly in the form of new early intervention for psychosis services. Fur-thermore the therapeutic armamentarium of psychological interventions in the fieldof psychosis has broadened considerably, and there are many excit-ing developments in this area. However the effectiveness of any intervention depends on the willingness of the patient to engage with both the service and the individual interventions in a sustained manner. Engaging people with a psychotic illness can prove challenging. Nonetheless a collaborative approach and a deeper understanding the role of individual appraisal may con-tribute to improved engagement and management of the illness and thus lead to better recovery outcomes. THE LETTER 55 & 56 Spring/Summer 2014, pages 53-64. The Danish National Schizophrenia Project is used as a background for presenting some phenomenological characteristics of persons in psychotic states of mind, some psychoanalytic concepts grounded in the phenomenology of the psychotic self, and some elements in the supporting psychoanalytic approach. Finally, the concept of cure will be presented as an increased capacity for symbolisation. In the last 20 years, an increased interest among psychiatrists and psychologists in the revival of phenomenological psychiatry has taken place. The focus of this interest has mainly been in the fieldof diagnostics, and this approach has, to some extent counteracted the objectifying, reductionistic, symptom-focused mode of diagnosing psychopathological disorders in the DSM- and ICD-dominated mainstream psychiatry. In Denmark, the psychiatrist, Josef Parnas, has worked with the philosopher, Dan Zahavi, and the American psychologist, Louis Sass, to investigate the phenomenological aspects of schizophrenia. THE LETTER 55 & 56 Spring/Summer 2014, pages 65-73. The concept of lack in Lacanian theory leads to the Lacanian Real. How can the Real take the place of a conception of psychosis as a lack in the Symbolic, thought of as foreclosure of the Name-of-the-father? Reality appears in connection with the possible. The Real is in connection with the impossible. The psychoanalytic discourse is the science of the Real in so far as it is touched in the meeting with the impossible. It is possible to focus on this Real in the approach to psychosis. In 1908, Bleuler said ‘for the sake of further discussion I wish to emphasise that in Kraepelin’s dementia praecox it is neither a question of an essential dementia nor of necessary precociousness…’. For these two reasons, he in-troduced the word ‘schizophrenia’, the firstof which consists in not taking the problem as a lack of an essential human element. The second reason consists in not placing the problem in a genetical conception. The question is, how to approach psychosis? First of all, to not think of it in terms of deficienc. And then not in terms of genetics, neither physical nor psychological genetics. THE LETTER 55 & 56 Spring/Summer 2014, pages 75-79. Thank you very much Barry and Patricia for inviting me to speak here today. I’d like to start with some reflections. I suppose firstly I regret waiting until my greying years to speak openly about what has been sitting with me for a long time. I regret deriding with all my superior medical arrogance those, including many of you here, who sought to see a greater meaning in all that we suffer, thereby, essentially rubbishing all that was not ‘biology’. I feel sadness that I have made, and indeed continue to make, many patients suffer with reductionist, ineffective and often coercive treatment. Finally, I’m fear-ful that my attempts to demolish, in just a few words, an entire world view, hitherto held very firmlyby me, may appear crass and over simplistic, but with that in mind I will proceed. THE LETTER 55 & 56 Spring/Summer 2014, pages 81-91. This paper is an account of an entrée by psychoanalytic methodology and practice into the public psychiatric service in what is now HSE Dublin North at St. Francis Day Hospital Raheny, chiefly by referrring to a seminal case of intractable paranoia, the analysis of which lasted over three years leading to the acceptance of what has become a valuable contributor to psychiatric treatment within the Kilbarrack catchment area. In November 1996 I telephoned St. Ita’s Hospital (SIH) to see if I could speak to someone about gaining experience working with patients who were men-tally ill. I was referred to a Dr Mullaney (now deceased) for contact. He was the man I needed to see – the main man – the Clinical Director as it turned out. So some days later when I phoned him he listened to my request and asked if I would forward a CV which I did. THE LETTER 55 & 56 Spring/Summer 2014, pages 93-102. This paper attempts to assess the psychoanalytic treatment of psychotic illness at a publicly funded centre in Canada. This treatment ‘after Lacan’ is thought to amount to treating delusions with the patient’s own dreams, or subordinating the Imaginary to the Symbolic. As a critique ‘after the later Lacan’, the paper draws on current debate and practice in France which applies the later Lacan’s turn to the Real, and in particular his theory of knots, to the treatment of psychotic illness. The 388 is a centre for the psychoanalytic treatment of psychotic patients in Québec City in Canada. When Willy Apollon and others firstintroduced Lacan’s teaching to the members of GIFRIC Group interdisciplinaire Freudien de recherche et d’intervention clinique and at the University of Laval in the mid-1970s and 80s, they believed that Lacan’s approach to psychosis pro-vided only preliminary remarks rather than definiteguidelines for the psycho-analytic treatment of psychotic illnesses. Hence the title of the collection of essays by Apollon, Danielle Bergeron, and Lucie Cantin, all training analysts in GIFRIC, After Lacan. Clinical Practice and the Subject of the Unconscious.